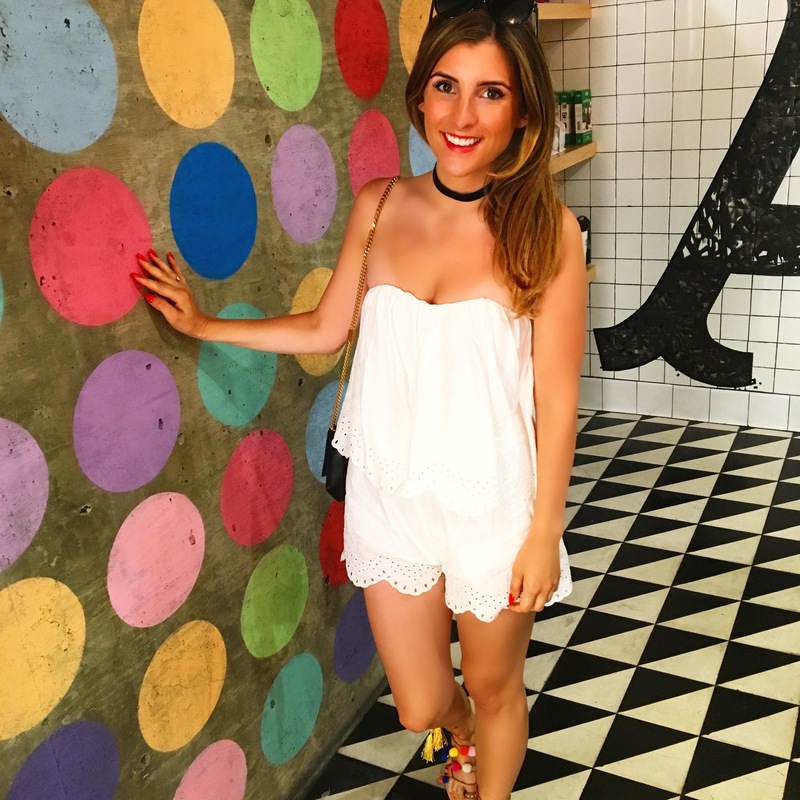 After getting our caffeine fix we then strolled down Melrose Avenue, stopping off at all the hot spots including the infamous pink wall! I’m wearing a white play suit from H&M and my colourful Ego Pom Pom sandals with my YSL bag. I didn’t realise that ‘The Pink Wall’ was part of Paul Smith but what an amazing attraction for them! People were actually queuing to have pictures outside! Such a perfect Instagram opp! We carried on shopping (recommendations further down) and even stopped off at DASH the Kardashians boutique. It actually looks quite shabby from the outside and we were expecting tacky clothes but were pleasantly surprised! I bought this playsuit, although think I may have been having a white playsuit sort of day, as I was wearing a very similar one! We grabbed cold pressed juices from L.A. Juice to refuel and had charcoal shots, which made a change from the shots of tequila we’d had the night before! The Reformation. We loved this shop, so many unique pieces, that look and feel really good. I found a gorgeous silk red nighty style dress that was a one off and I love it! There’s also a fridge with free boxed water in it, always a bonus! DASH. Ignore the outside shabbiness and the preconception of Kim’s early naughties style. Have a browse in here and you’ll definitely try on a few items! It’s not super pricey and not too cheap, about $150 for a dress. American Rebel. If you want a vintage shop, that’s laid out nicely and has wearbale cool items, then head here. There were a few gems amongst it all too with labels like Dior. Nasty Gal. This is a great, shop, easy to buy the whole place, great little dresses and nice shoes. (Very wearable clothes rather than pieces that look cool and but never actually wear them)! Fred Segal. you have to go in here just for the iconic name, you are on Melrose after all! We then headed home calling by the Roosevelt Hotel for a quick cocktail by the pool, how could we resist! And a quick look at the Hollywood stars and Chinese Theatre… I even found my very own star…well almost!